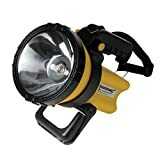 A hand crank conveniently generates power for more than 8 minutes' lighting by 1 minute's crank (basing one speed of two round per second). Weight : 143g (Include efficiency Cree LED XP-L2 V6 chip (100% Imported ),using a good design PCB and Electroplated aluminum light cup, MAX can be 1200 Lumens ，Real tested! Light beam can shot very far . Features 5 adaptable settings: Low/Medium/High/Eco and then twice half press to be SOS. Please refer to the instruction manual for how to change the modes, thanks !! MEMORY FUNCTION & SMART DESIGN : If you turn off in high mode, after a few minutes, turn it on, it is still high, please check the memory function in the user manual.And multifunction, it stands on-end for full-room illumination. 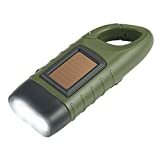 USB RECHARGEABLE & LONG-LASTING: Our LED Flashlight own one rechargeable 18650 battery inside when you get,can be charged directly,using our USB cord,connect the flashlight and power supply , such as laptop,car charger, etc.After charge full,can use max up to 143 Hours at Eco.And it has low power warning function, will blink when the battery is low.please see user manual. WATERPROOF & PORTABLE: IP68-rated water resistant and designed for use in heavy rain.And without the USB port cap, it can be waterproof too !! Its durable aluminum body and smart shape design,easy to carry every day.Use it while hunting, hiking,Bike Riding and so on. TWO-YEAR RETURN POLICY: Buy with confidence. 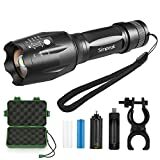 You have 2 years to put this flashlight to the test and through its paces. Every purchase comes with an extended two-year return policy and friendly customer service provided by WUBEN, which has companies in China ,USA and Japan. 【Super Bright】True 800 lumens light output from the Powerful LED Chip that emits bright light over the length of seven basketball fields (643ft/196m) and reach over 656ft. Features 5 useful modes: High/Medium/Low/Strobe/SOS. 【26650 Rechargeable Battery】The Upgraded 26650 Li-ion battery provides much longer run-time than those use 18650 battery on the market. Up to Max 4hrs illumination output with protected integrated PIC design. Genuine CREE LED lasts 50000 hours of use. 【Exclusive USB Charger】Backwards Compatible with all Version of USB Ports, it allows recharging the flashlight with any power adapter/battery pack. 【Tough & Reliable】IP65-rated waterproof and designed for use in heavy rain. Its durable aircraft grade aluminum body with military grade hard-anodized clip slot endure rough handling. 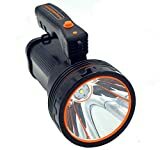 【Complete Set & Warranty】You get BYBLIGHT Led Torch, 26650 Li-ion Battery (Pre-load), USB Charger, Mini Solar Keyring Torch, wrist strap, user manual. Worry-Free 18-Month Warranty and friendly customer service provided. FIVE LIGHT MODES -- One button controller for 5 lighting modes, high light, middle light, low light, strobe and SOS light for your choice. Convenient for your using. Widely Used: The large comfortable handle and the length adjustable shoulder strap (detachable) making it pretty handy when you go camping, exploring, searching, etc. SUPER BRIGHT & HIGH QUALITY: Binwo high Lumen Torch LED Bulb provides bright light, powerful Lumen LED generates a brilliant large area floodlight or a perfectly focused spotlight over a beam distance of 656ft/200m. Intense spotlight for long range observation. 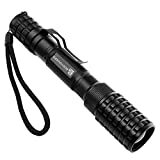 Super bright high performance LED tactical flashlight with high quality of 50,000 hours working life. We would like to offer a 6-month warranty to all our customers. 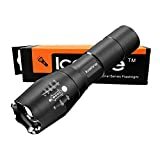 ZOOMABLE FLASHLIGTH & ADJUSTABLE FOCUS: The LED flashlight utilize the latest durable CREE XML T6 LED chip, provides super bright light beam. 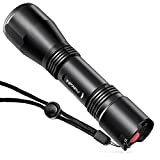 This high-quality CREE LED Torch supports distance with easy-controlled head-pulling zoom and easy mode-switch by light taps of button. 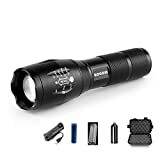 You can adjustable focus range for different usage, stretching to adjust its focus and get spot beam and flood beams you need.Super bright zoomable focus perfect for distant observation and wide range illumination. 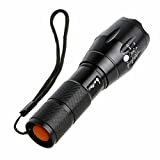 5 LIGHT MODES CAN BE EASILY CONVERTED: Binwo LED tactical flashlight supports five switchable modes, High / Medium / Low / Strobe / SOS. A full-press to switch on and off and a half-press to cycle through lighting modes (a rapid off-on press also cycles lighting modes).Convenient for your using. 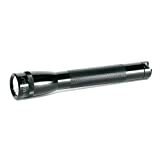 SUPER DURABLE:The body of this torch is built of high quality aluminum alloy aero grade, strong military grade hard anodized. Special six-teeth safety hammer head design for self-help in emergencies. You can use it to defend yourself, break glass, or alert emergency services with the SOS function. 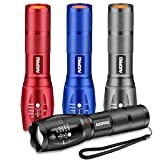 PORTABLE MINI SIZE: Binwo waterproof torch is portable mini size, Length: 5.39in, Diameter: 1.37; Weight 185g, fits well in your hand or pocket. Compact to fit easily into your pocket wherever you go. Skid-proof design & waterproof for multiple outdoor uses in adverse weather conditions. Push button tail switch for easy one-handed operation, feel more comfortable and safe. LED TYPE:Super Bright 10 pieces Cree XM-L T6 LED 10000 Lumen. HIGH QUALITY: Aircraft-grade Aluminum Alloy, sturdy and durable. USAGE: For home, hiking,camping,travelling,hunting and other outdoor activities. 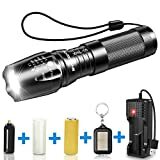 ADVANCED VERSATILE DESIGN:Ultra-bright Cree T6 LED Torch is made of high grade aluminium alloy means that this lamp is virtually indestructible. Dependable skid-proof & water-resistant design for multiple outdoor uses in adverse weather conditions. 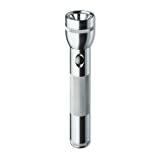 SAFETY HAMMER HEAD: Special six-teeth safety hammer head design for self-help in emergencies. You can use it to defend yourself, break glass, or alert emergency services with the SOS function. 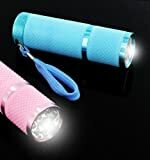 OPTIONAL POWER SOURCE: Powered by 1 x 3.7V 18650 battery (buy in set) or 3 x AAA battery (battery not included) up to your choice.The Mini LED torch light is porfect for hiking, walking the dog, or for keeping in the car, you can take it with you anywhere. 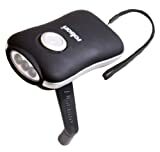 ADJUSTABLE FOCUS: Spotlight for long range observation; Floodlight for large area illumination. 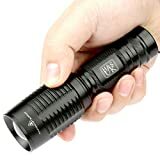 SUPER BRIGHT: Output bright can come to 800 lumens (MAX), 5 Mode（ high/ medium/ low/ strobe/ S.O.S.). 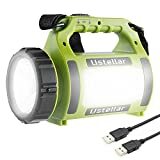 POWER SOURCE: 1 pcs 18650 Lithium-ion Battery (Not included) or 3 pcs AAA Battery (not included). ADVANCED DESIGN: Skid-proof design & waterproof design, Best suitable for Outdoor Camping. Make your travel safe. 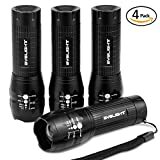 Pack of 4: Small LED Torches, One button, simple to use. Wrist strap included easy to carry. 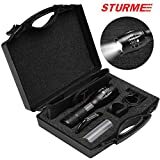 FIVE MODES AND ADJUSTABLE ZOOM: High, Middle, Strobe and SOS. Adjustable focus range for different usage. 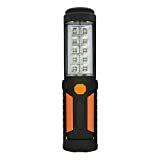 RECHARGEABLE FLASHLIGHT: Rechargeable 18650 Battery and charger is included, you can also use 3 X AAA Batteries. 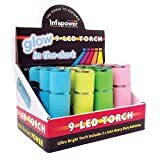 Low power consumption and long running time. 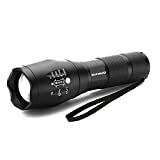 SUPER BRIGHT: It produces lots of light, very bright and has different brightness settings and light modes. Output brightness can come to 2000 lumens. 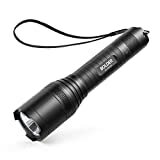 POCKET TACTICAL FLASHLIGHT: This small aluminium flashlight is very strong but very lightweight and fits perfectly in your pocket. 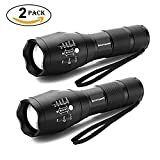 WATER RESISTANT: The flashlight is water resistant which means it can be used in heavy rain and it will withstand all weathers. 【Powerful Brightness】This Cree LED Torch Includes XM-L2 bulb(T6 Upgrade bulb),max output 1200Lumen. 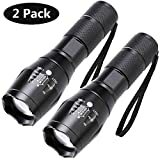 It is much brighter than these flashlights with t6 bulbs on market.It provides you a much wider field of view. 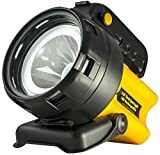 【Zoom adjustable & 5 Lightmodes】The torch allows you to select focus between spot and flood beam.Functional 5 Modes: High,Medium,Low beam,Strobe and an SOS switch mode. 【Durable and Water resistant】Its durable aircraft grade alloy body with military grade hard-anodized clip slot endure rough handling. IP-X6-rated waterproof and designed for using in heavy rain. 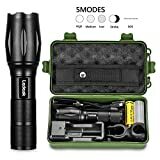 【Complete Set and Warranty】Ultra Bright Professional Tactical LED Flashlight +18650 Rechargeable Lithium Ion Battery +18650 Battery Sleeve + Battery Charger +Green Box Case+ 3 X AAA Battery Holder+ Bike Flashlight Mount Holder+Flashlight Holster.Worry-Free 12-Month Warranty and friendly customer service provided. LONG-LASTING: Up to 6 hours (Medium-beam mode) of powerful, non-diminishing brightness from the included premium rechargeable 3350mAh battery. LEDs boast an extended 50000-hour lifespan. Recharge in 6 hours with a 1A adapter (not included) and the included USB cable. 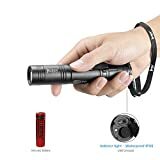 WHAT YOU GET: Anker LC90 Flashlight, 18650 3350mAh rechargeable battery, Micro USB cable, wrist strap, welcome guide, and our worry-free 18-month warranty and friendly customer service. SMART-DESIGN: Adjustable beam able to light over the range of about two football fields (262 yd / 240 m ), lightweight and easy to carry around. SUPER-BRIGHT: The most undated Cree LED can generate up to 800 lumens light output. 5 Light Modes (High / Medium / Low / Strobe / SOS). Press and hold the switch is the fast way to turn off the light. 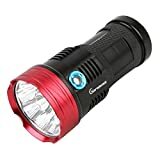 TOUGH AND RELIABLE: The aircraft aluminum body and IP65 waterproof design is the best ideal for anyone who spends a lot of time in outdoor activities such as dog walking, hunting or extended camping trips in the wilderness. 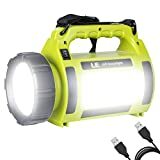 LONG-LASTING: Up to 120 hours (Low mode) of powerful, non-diminishing light from included premium rechargeable 18650 Li-ion battery. Recharge in just 6 hours with any charging sources with a 5V±2A output such as phone charger, car charger, laptop or solar panel. 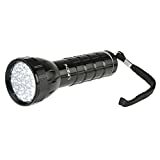 WHAT YOU GET: INFRAY genuinely LED Rechargeable Torch with lanyard and our worry-free 18-month warranty. We would like to establish a sense of trust with our customer by high-quality product and after-sales service. WIDELY USED. 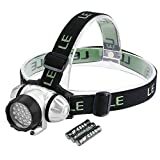 Great for night reading, camping, adventure racing, caving, mountaineering, climbing, cycling or use in an emergency. High-performance LEDs, 36+5 LED work light,wide angle,bulbs last more than 100,000+ hours. 360 Degree pivoting base with powerful magnet & rugged hook,Shockproof. 6 Working hours and more per 3 new batteries, 3 x AA batteries required (not included). 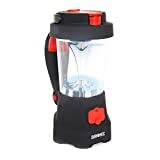 Perfect for camping, hiking, backpacking, auto or building work, emergency roadside, power outages, fishing, car repair emergency.